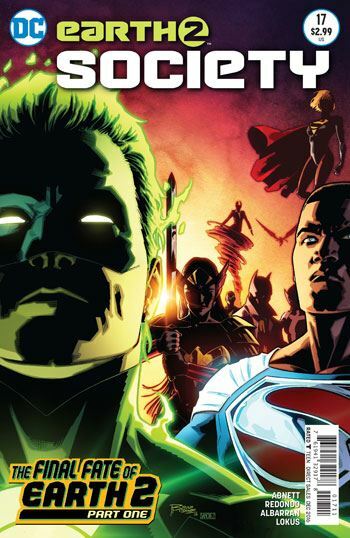 The final two part storyline begins in Earth 2 Society 17, a really creepy chapter that does not look like it will bring any sort of happy ending to the long and tortured situation the heroes have been facing on their new world. Dan Abnett does a great job evoking the sorrow and anger that the various characters feel when they wind up in a colourless blueprint of their old Earth, a completely inadequate replacement created out of the Pandora’s Box by Fury at the conclusion of the previous issue. Fury herself is consumed by guilt, although her desperate actions were the best possible course of action at the time, to prevent the Ultra-Humanite from using the Box himself. While their world seems lost for good, as well as most of the population of it, the heroes that have been the core of the story have survived into their new, hollow realm. What keeps the tale from descending into a complete maudlin mess is the mysterious appearance of Sandman. Or rather, the Sandmen. Looking as menacing as only a man in a trenchcoat and gas mask can, these figures are out to get the heroes, although who is controlling them, and why they are acting this way, is in no way clear. I really have no idea what will become of this Earth 2 concept once Rebirth is done, but based on how this title is ending, I don’t foresee anything good for them. Although Earth 2 was one of the best elements of the New 52, the signs seem to be pointing to the resurrection of the original incarnation of that world, and the classic Justice Society. While I would be overjoyed to see them back, I will admit that this version has also gained a place in my fanboy heart.